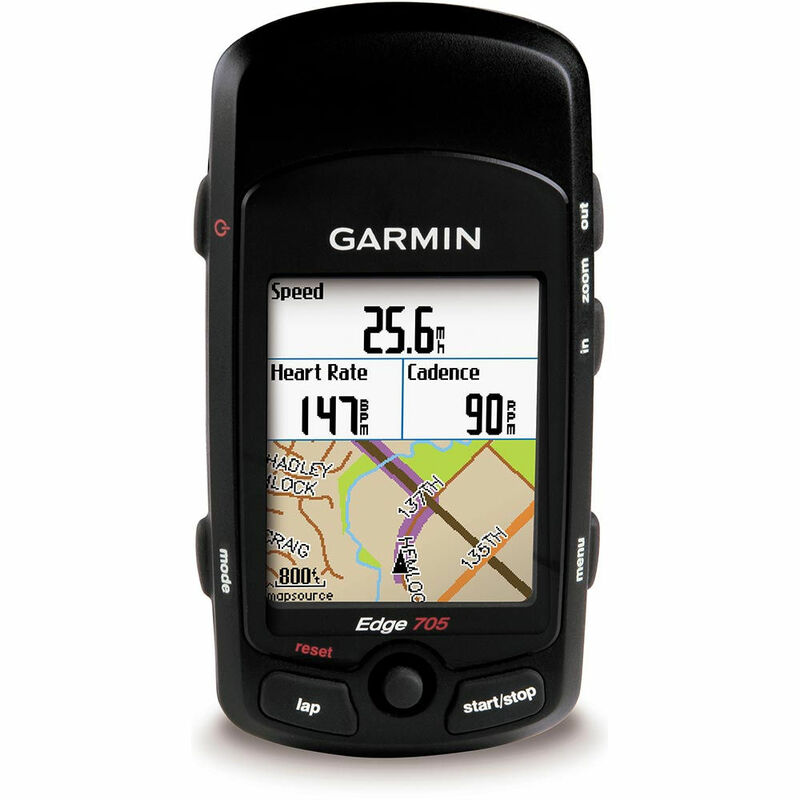 I bought a Garmin Edge 705 when my first road bike was delivered. I used it initially to record where and how far I had ridden. You can download the details of your rides to a Garmin website called Garmin Connect. Among other things Garmin Connect displays maps showing exactly where you went on your ride, or run or hike. It was fun to be able to show my biker chick where I had gone on my bike. When I started doing longer rides with the West End group I used the speed display to help me keep a consistent pace when I took my turns at the front of the peloton. I hadn’t bothered to install the speed sensor, or the cadence sensor for that matter. I depended on the speed data calculated by the GPS chip. I used the heart rate monitor out of a casual interest in what my pulse rate was rather than as a training aid. I rode solo during my first year in the Netherlands. The “Back To Start” function came in useful on more than one occasion. One canal, or windmill, 0r field of cows looks much like another. No help when you are lost and 40 km / 25 mi from home. The heart rate monitor saw some serious use once I started doing organised rides (by that I mean longer and faster than I was used to) with the Not Possibles. By that time I had a rough idea of what my heart rate zones were. Tracking my pulse rate helped me manage my effort so that I didn’t wear myself out before the end of the ride. Since 31st January 2010 I have been transferring all my rides to Garmin Connect. There are 412 rides in my account. I took a look at all that data today. The first set of numbers shows how much ground I have covered on my bicycles in three and a half years. Enough to get me from Kuala Lumpur to Warsaw and back. 24,448 km / 15,191 mi. 68% of my time since January 2010 has been spent in the Netherlands. It follows that most of that pedaling was amongst windmills and canals. What surprised me was the average length of my rides. 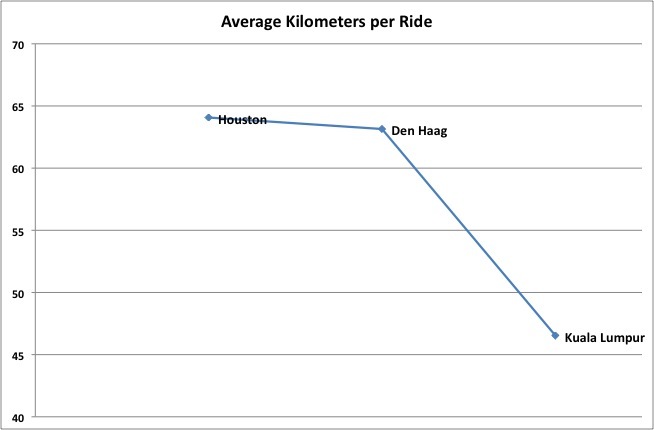 I hadn’t expected the average Houston ride to be slightly longer than the average Den Haag ride. I must have done more 20 to 30 km / 12 to 18 mi rides in Holland than I thought. 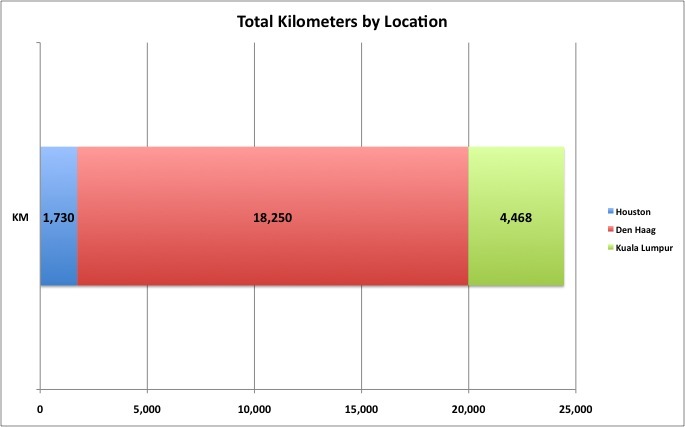 I am not surprised that the average ride length has dropped in Kuala Lumpur. I do the Damansara Heights ride fairly regularly. That one never exceeds 16 km / 10 mi. The Putrajaya ride tops out at just over 20 km / 12 mi. The shorter rides in Kuala Lumpur are somewhat made up for by more frequent rides as compared to Houston and Den Haag. 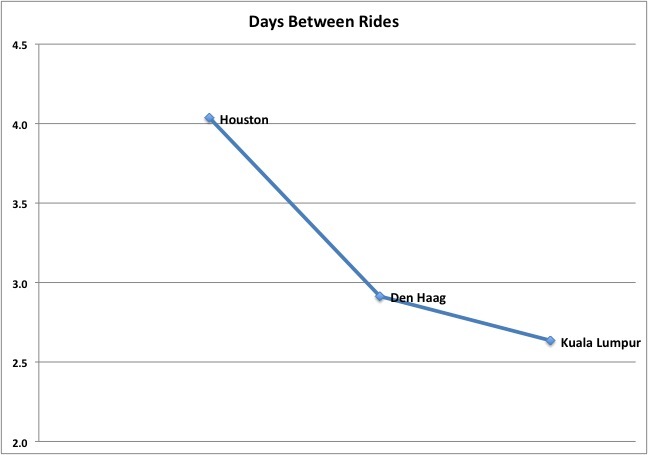 I rode on average every 4 days in Houston. In Kuala Lumpur it is every 2.6 days. I put that down to linking up with a group of cyclists as soon as I arrived in Kuala Lumpur. There are four or five groups rides per week in Kuala Lumpur. 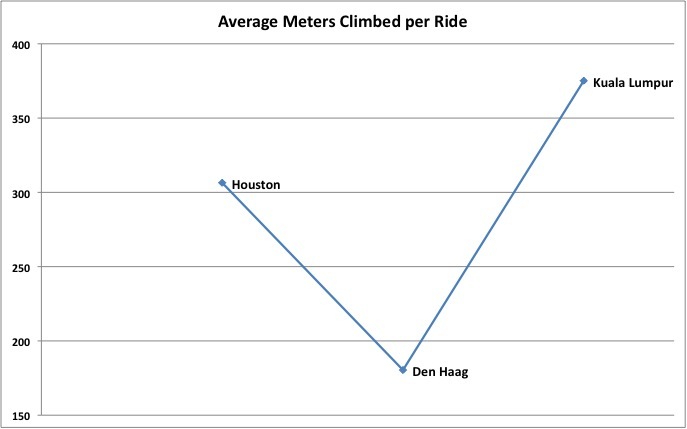 There were three weekly group rides in Houston, and only one per week in Den Haag. Elevation data is suspect. The barometric altimeter in the Edge 705 is not accurate if it is not calibrated before every ride.. I don’t bother. Websites like Strava and Ride With GPS allow users to overwrite GPS elevation data with data calculated using a variety of data sources and algorithms. This “corrected” elevation data is often, but not always, more reliable. Nevertheless, it is interesting to look at elevation data for comparative reasons. 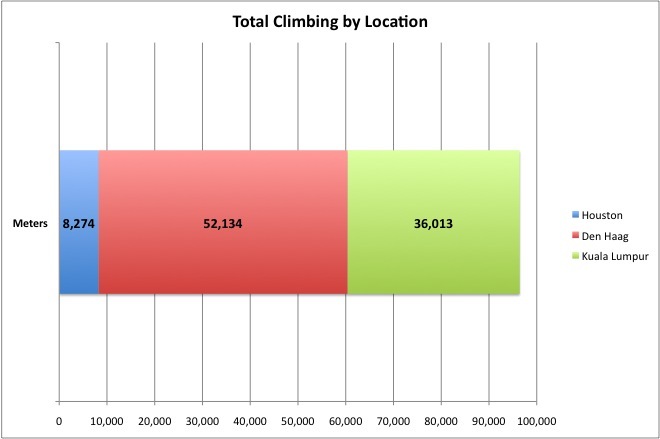 I did expect the data to show that rides in Kuala Lumpur require the most climbing. The average for Houston surprised me at first, but upon reflection it makes sense. Chappell Hill was within easy reach by car. We rode quite a bit there. Training for the hills of Austin that were to come in the BP MS150! The Netherlands is as flat as advertised. Cyclists are only partly joking when they say they go to a multi-storey car park to practice hill climbs. The Dutch hide some elevation in the dunes along the coast but that is about it. The climbing average for Den Haag is padded by a few visits to Limburg and Belgium, where there are some real hills. Regular readers will already know that I was startled by the degree of climbing required when riding around Kuala Lumpur. It won’t be long before I surpass the number of meters I climbed whilst in the low country. The final number is also for guidance only. You know what I mean if you have ever looked at the “calories burned” numbers that exercise machines produce. 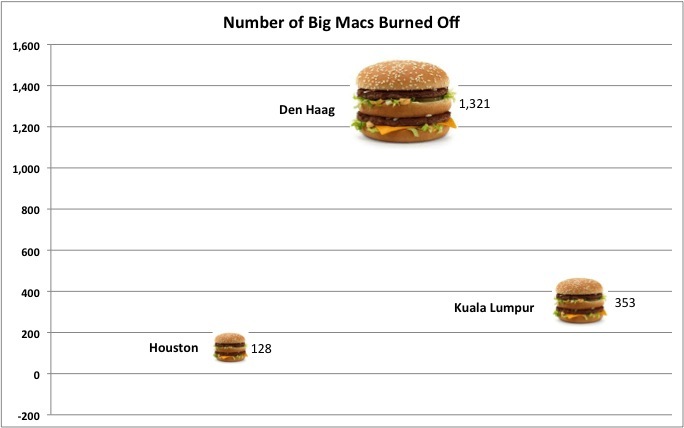 However I won’t let details get in the way of feeling pleased with myself for burning the caloric equivalent of 1,802 Big Macs. A milestone ahead, pardon the pun, is 25,000 km / 15,534 mi total distance. I’ll be beyond 1,000,000 calories burned by then. I wonder what number that would be in nasi lemak terms? Posted in Cycling in Malaysia, Cycling in Texas, Cycling in the Netherlands and tagged Altimeter, Cadence Sensor, Calories, Edge 705, Elevation, Garmin Connect, GPS, Heart Monitor, Ride With GPS, Strava. Bookmark the permalink.